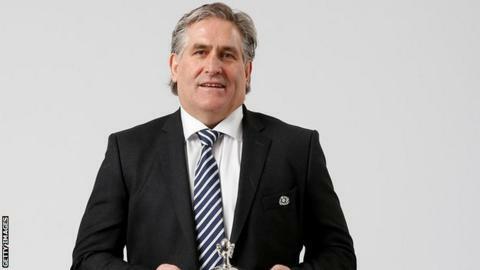 Wales legend Jonathan Davies says Scotland Six Nations boss Scott Johnson has yet to prove himself in a top job. Davies rates ex-Wales caretaker coach Johnson as a "great motivator", but claims "there is still a question mark over him". Wales go to Murrayfield on Saturday with some Welsh players expecting mind games from former boss Johnson. But Davies told Scrum V: "I don't think that he's actually proven anything as a head coach yet." Scotland currently sit joint-second with Wales in the Six Nations table, having won two of their three games - against Italy and Ireland. They lost to England. Johnson was a Wales assistant coach under the reigns of New Zealanders Graham Henry and Steve Hansen, then Welshman Mike Ruddock, from 2001-2006. He also took temporary charge when 2005 Grand Slam-winning coach Ruddock left during the 2006 Six Nations tournament. Wales lost to Ireland and France and drew against Italy under Johnson. The Australian then returned to his homeland as the Wallabies' assistant coach ahead of the 2007 World Cup, where they lost to England in the quarter-finals. But he was back in Wales, as Ospreys director of coaching, in 2009 - guiding them to the Pro12 title that season. Johnson left the Ospreys in February 2012 after he announced he was to become Andy Robinson's assistant coach with Scotland, but when Robinson quit as head coach in December Johnson took on the task for the 2013 Six Nations. Davies, the former Wales fly-half and captain, says Johnson's experiences have been largely in coaching understudy and support roles and that being the figurehead demands different attributes. He said: "He's a great motivator, he seems to have a fun time with all the boys and the boys seem to like him. "But there's a big difference between being a skills coach and number one coach. "And I don't think that he's actually proven anything as a head coach yet. "And that's the question. It's alright doing passing and skills and everything, which are basic skills. Everybody should have good basic skills. "But to analyse an international match [is different] because internationals are all about picking the right side and getting the right tactics right to win Test matches. "So there is still that question mark over him as a number one coach and I think he'd agree with that because wherever he's been he hasn't been that successful yet." And Davies believes the Australian's reaction to Scotland's gutsy underlined the significance of the of the result for Johnson. "You see what it meant to him when Scotland beat Ireland, his fists pumping at the end there," said Davies. "It really meant something - one, for them to win as a national side against a big, big team but also, I think, something for him as well, to be quite honest. "For him to win on the big scene as well is vitally important for him."